The new price dynamic of commodities is unprecedented. Purina has been collecting data on eastern Canadian farms since 2004. This data bank, which now includes one fourth of all Eastern Canada's dairy farms, shows that the average feed cost per hectoliter has grown from $15/Hl to $20/Hl during this period. This is about $1.50 more per cow per day. Return over feed (R.O.F.) represents the revenue left from milk production once you have paid for feed costs. The R.O.F. 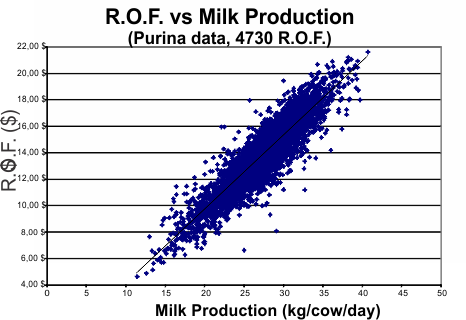 has the advantage of taking into account milk composition and thus represents the real revenue from milk production. 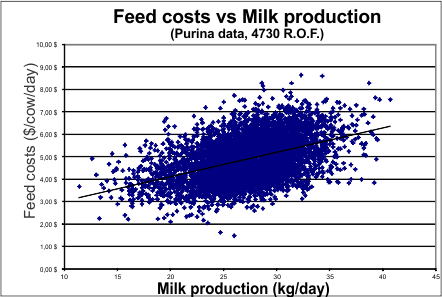 Feed is an important cost of milk production. Indeed, data collected by Purina confirms Valacta's number showing that feed costs per cow per day do increase with milk yield. 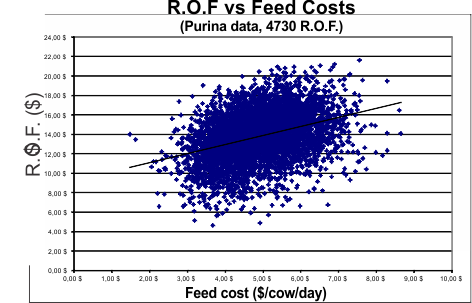 However, there is no relationship between this feed cost per cow per day and your profits (R.O.F.). This next graph shows, for example, that with a feed cost of $5.00/cow/day some herds can achieve a profit of $10.00/cow/day while others achieve a profit of almost $18.00 for the same feed cost. This represents more than $200,000 annually for a 75 cow herd. What is your current R.O.F.? What are the strategies to put in place to increase it? The more you invest in your herd's performance the better your profitability. This is because of the improvement in your dairy efficiency. 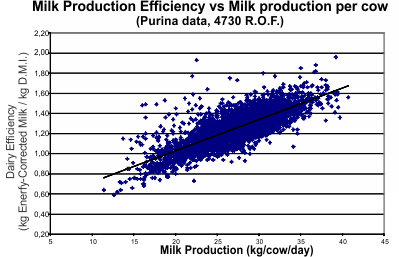 As the graph shows, your herd's efficiency improves as milk production per cow increases. HOW CAN PURINA HELP YOU? With the R.O.F. calculator your Purina farm consultant can quickly and regularly evaluate your feed costs and your revenue from milk production. He will also evaluate the efficiency of your milk production. With your Purina consultant and a regular follow-up of your herd's feed costs and cow productivity you will achieve more profitable feeding strategies. How about controlling your feed cost and increase your milk revenues? Here are the results obtained from our Purina customers as compared with non-Purina customers. A $0.91/cow/day increase represents an additional profit of almost $25,000 per year for a 75 cow herd. SO WHAT IS YOUR R.O.F.?? Speak to your Purina consultant about establishing together the follow-up of your herd's performance and increase your profitability!